Beet Pasta Dough (pinkish-red hue): Preheat the oven to 400 degrees F. Roast 1 large beet in aluminum foil, about 45 minutes, or until tender. Peel the beet and puree in a food processor. Add the... Place flour and salt in a food processor. With motor running, add eggs one at a time. Process until dough is elastic and firm, about 2 minutes. With motor running, add eggs one at a time. Process until dough is elastic and firm, about 2 minutes. Directions. Combine flour, eggs, olive oil, salt and pepper in the b owl of a food processor. Whirl in short bursts until dough comes together, about 15 seconds. 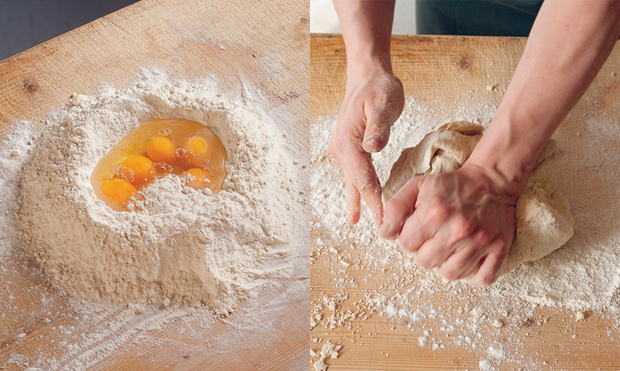 14/06/2012 · Making fresh pasta dough is especially easy if you use a food processor. There are endless variations for flavoring the pasta and shaping it.